Get fit with the new chrome Total Trainer DLX II! 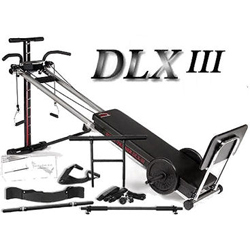 The Total Trainer DLX II was designed to give you a convenient, efficient and effective full body workout in the comfort and privacy of your own home. While many home gyms have 8 to 10 resistance levels, the Total Trainer DLX II has 11 levels of resistance that allow you to lift from 4% to 69% of your body weight. With your help we can reach more people and let them know about Total Trainer DLX II whether this product works or not.